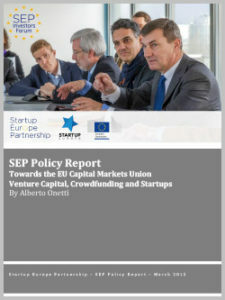 This Report includes the outcomes of the SEP Investors Forum Workshop: “EU Capital Markets Union” organized in Brussels on March 25, 2015 together with DG FISMA and DG CONNECT. The byOinvitationOonly workshop involved targeted venture capital investors, tech startups, and finance experts from the startup community to discuss the obstacles startOups face to access finance from Europe’s capital markets, as well as possible measures to overcome these obstacles in the context of putting in place the building blocks for a Capital Markets Union by 2019. In this context, SEP Investors Forum Workshop specifically focused on the discussion of actions that could facilitate the access of European startups to capital, and the impact of such measures on the tech startup ecosystem. The conclusions of the discussions have been reflected in this report, which was submitted to the European Commission on April 30th.